Today's (Sunday, 2016 April 24) APOD image has appeared on APOD before and was indeed quite widely circulated in the 1990s. We are curious, however, how many newer viewers of APOD are unfamiliar with some of astronomy's classic older images. APOD reruns images on Sundays partly to bring back to light famous astronomical images for those who have never seen them. Therefore, by answering this poll question honestly, you are helping APOD's editors better know what fraction of APOD's current audience might have or have not seen a historically famous astronomy image. Note, though, that this image is particularly famous, and we would therefore expect perhaps a comparatively high fraction of our viewers to have seen this image previously. I've certainly seen it before, so I answered yes, but I'm equally certain I saw it first somewhere other than APOD. So consider my vote a Yes-But. Yes, but it is lovely. Yes, um, Time Life book in grade school? The Universe? Good stuff. Yes, and I think it was several times on APOD already. Ah, yes, indeed. It seems to be the default when the editors of APOD don't have any nice novelty. Probably on APOD first, many times here and elsewhere since. Even went back to pre Hubble pics of Eagle to see why we were so startled when the Pillars were first featured. Many times Thanks! mountman wrote: Probably on APOD first, many times here and elsewhere since. 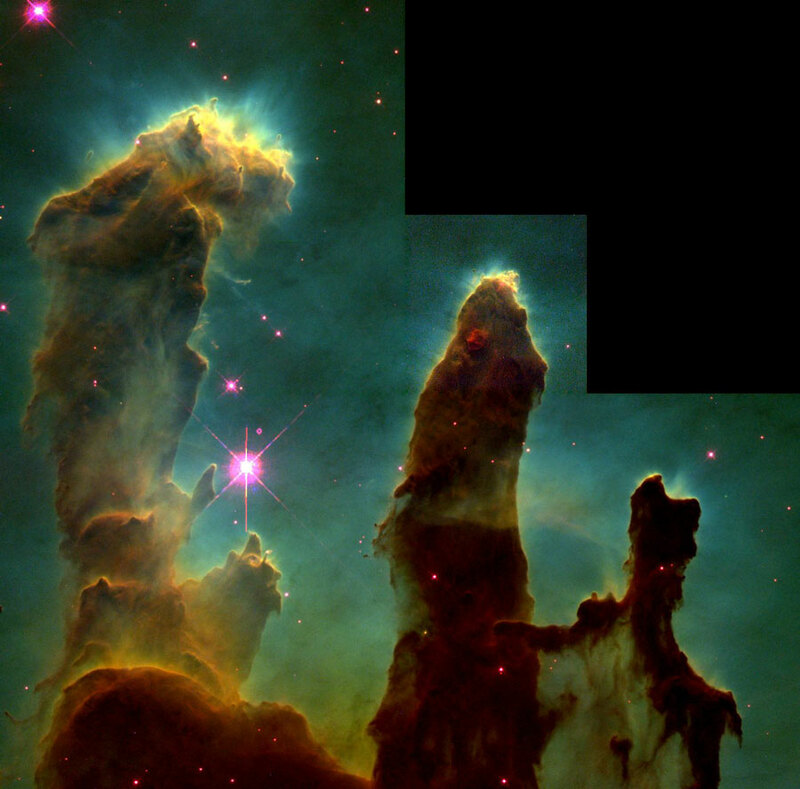 Even went back to pre Hubble pics of Eagle to see why we were so startled when the Pillars were first featured. Many times Thanks! Especially noteworthy since rightmost pillar reminds me of a departed doggy friend. Older than APOD and the Hubble, not as old as the Pillars. I first saw this on a poster in a science shop in the 90s, when most Hubble pics were new and wondrous (and they never stopped). If any one photo encouraged me, more than ten years ago, to study for a diploma in astronomy this was it. Yes, I've seen this many times in the past 20 years - its beauty begs to be reprinted because it is awe inspiring. Yes, I have seen the image many times already. Yes of course. But wow, 100% say the same. Is that a testament to the glory of the photo or the narrowness of the slice of people who visit this site? Yes, I remember it because it was so stunning. The APOD is one of my favourite websites for a brouse. Yes ,and thanks to pod , I've seen it before . I enjoy what you do . Keep uptake good work ! Yes ,and thanks to apod, I've seen it before . I enjoy what you do . Keep up the good work ! I have seen this one before, but didn't get a chance to vote since the poll closed even though it's only 12:30 in the afternoon!!? Hasn't anyone told the poll organisers that planets are round ? You bet I have, but who doesn't love a classic? Yes I have seen this image before. How could anyone not have? I have a poster of this in my office! Yes, I've seen it. How could I tire of this classic?! The APOD app sets each day's picture as my phone's home screen and I was delighted to see this one again today. Yes. don't know how many times, but I never get tired of it. Poll closed and its only 8 am Sunday?? ?